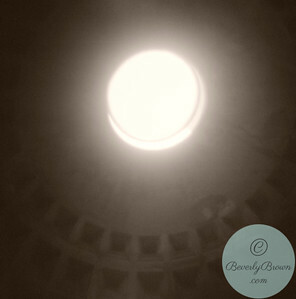 A sepia toned black and white photograph of Rome, Italy: view looking up at the oculus (the circular opening at the top of the cupola) of the Pantheon, the best preserved ancient building in Rome, Italy (118-125 A.D.). Made with a toy plastic Diana camera. © Beverly Brown. All Rights Reserved. 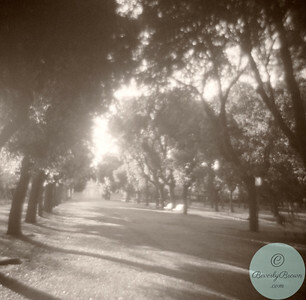 A sepia toned black and white photograph of a sunlit path and trees in the public gardens of the Villa Borghese in Rome, Italy. Made with a toy plastic Diana camera. © Beverly Brown. All Rights Reserved. 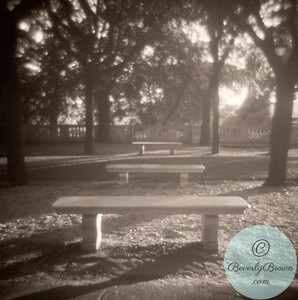 A sepia toned black and white photograph of a row of benches in the public gardens of the Villa Borghese, Rome, Italy. 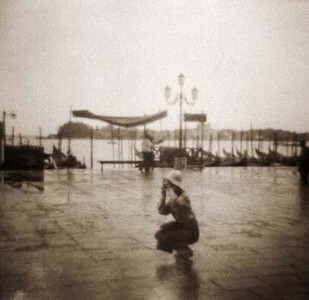 Made with a toy plastic camera. © Beverly Brown. All Rights Reserved. 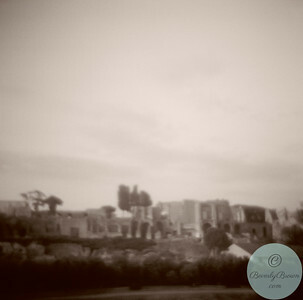 Sepia toned black and white photograph of Rome, Italy: view of the Palatine Hill and the Roman Forum. Made with a toy plastic Diana camera. © Beverly Brown. All Rights Reserved. 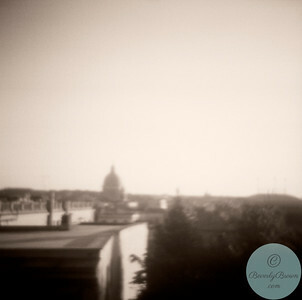 A sepia toned black and white photograph of Rome, Italy: view from the public gardens of the Villa Borghese of the dome of St. Peter's Basilica (Basilica San Pietro) in the distance. Made with a toy plastic Diana camera. © Beverly Brown. All Rights Reserved. Sepia toned black and white photographs of Rome, Italy: a marble sculpture of couple kissing - Capitoline Museum. 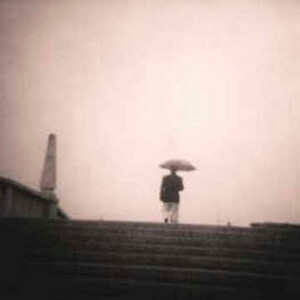 This was made with a toy plastic Diana camera. © Beverly Brown. All Rights Reserved. Sepia toned black and white photograph of Rome, Italy: a statue of a couple embracing - the Capitoline Museum. Made with a toy plastic Diana camera. © Beverly Brown. All Rights Reserved. 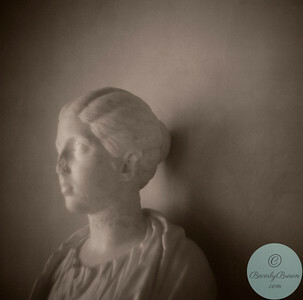 Sepia toned black and white photograph of a marble portrait bust of a young woman in the galleries of the Capitoline Museums (Campidoglio) in Rome, Italy. Made with a toy plastic Diana camera. © Beverly Brown. All Rights Reserved. 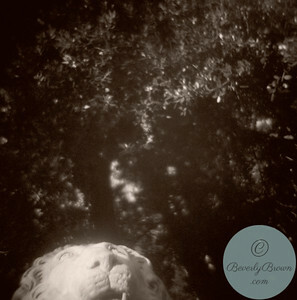 A sepia toned black and white photograph of Rome, Italy - Lion sculpture, Borghese Gardens. Made with a toy plastic Diana camera. © Beverly Brown. All Rights Reserved. 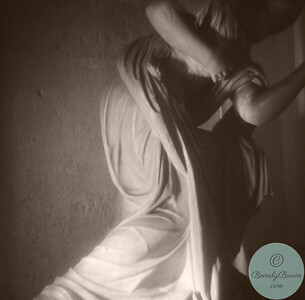 Sepia toned black and white photography of Rome, Italy: a marble statue of a woman with drapery in the Capitoline Museum. Made with a toy plastic Diana camera. © Beverly Brown. All Rights Reserved. 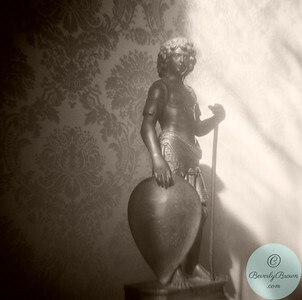 Sepia toned black and white photograph of Rome, Italy: a bronze sculpture of young male warrior in the Capitoline Museums. Made with a toy plastic Diana camera. © Beverly Brown. All Rights Reserved. 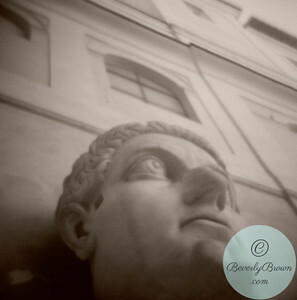 A sepia toned black and white photograph of Rome, Italy: the colossal statue of the head of Emperor Constantine, in the courtyard of the Capitoline Museums, located in the Campidoglio, the 16th century piazza designed by Michelangelo. Made with a toy plastic Diana camera. © Beverly Brown. All Rights Reserved. 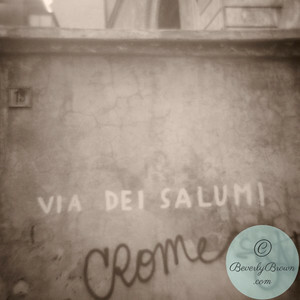 A sepia toned black and white photograph of Rome, Italy: grafitti on a wall. Made with a toy plastic Diana camera. © Beverly Brown. All Rights Reserved. 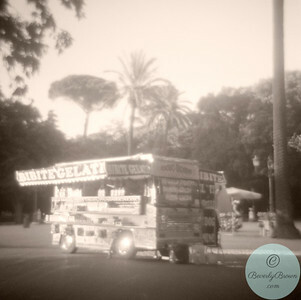 A sepia toned black and white photograph of Rome: a vendor selling ice cream and drinks in the public gardens of the Villa Borghese, Rome, Italy. Made with a toy plastic Diana camera. © Beverly Brown. All Rights Reserved. 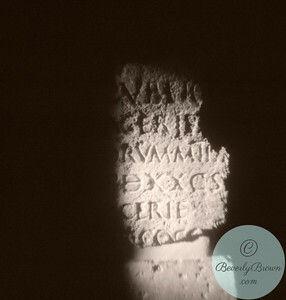 Sepia toned black and white photograph of Rome, Italy: fragment of an ancient Roman carved stone tablet in the Capitoline Museums (Musei Capitolini). Made with a toy plastic Diana camera. © Beverly Brown. All Rights Reserved. 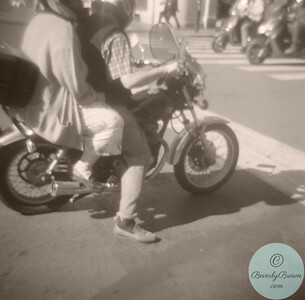 Sepia toned black and white photograph of Rome, Italy: couple riding a motor bike through the busy streets of Rome. Made with a toy plastic Diana camera. © Beverly Brown. All Rights Reserved. 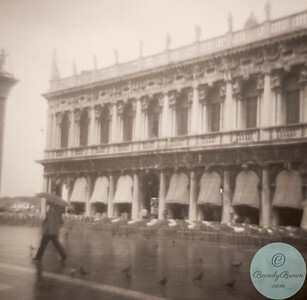 Sepia toned black and white photograph of Venice, Italy: a woman walking in the rain - Piazzetta San Marco. Made with a toy plastic Diana camera. © Beverly Brown. All Rights Reserved. View from window overlooking Grand Canal - Venice, Italy © Beverly Brown. All Rights Reserved. 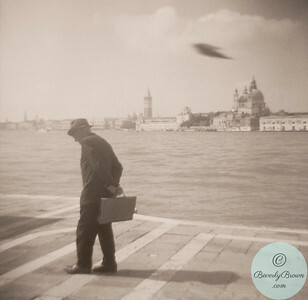 A sepia toned black and white photograph of Venice, Italy: an older man wearing a suit and fedora, carrying a briefcase, walks along the canal on the island of Giudecca while a bird flys above. No model release. Made with a toy plastic Diana camera. © Beverly Brown. All Rights Reserved. 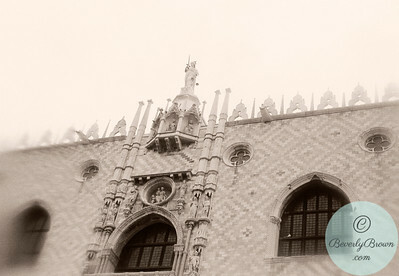 Cropped view of the Doges Palace in Venice, Italy. © Beverly Brown. All Rights Reserved. 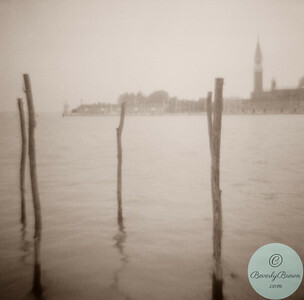 Sepia-toned black and white photograph of Venice, Italy: moorings in the Grand Canal. Made with a toy plastic Diana camera. © Beverly Brown. All Rights Reserved. 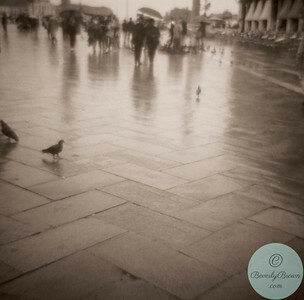 A sepia toned black and white photograph of Venice, Italy: a man and woman walking in the rain on the Piazza San Marco. Made with a toy plastic Diana camera. © Beverly Brown. All Rights Reserved. Man with Umbrella - Venice, Italy. Man walking over footbridge carrying an umbrella - Venice, Italy. No model release. This image is licensed exclusively by Getty Images - please go to gettyimages.com and search for image #6088-000170. © Beverly Brown. All Rights Reserved. 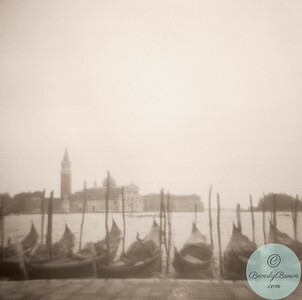 A sepia toned black and white photograph of Venice, Italy: moorings in the Grand Canal, - as seen from the Piazza San Marco. 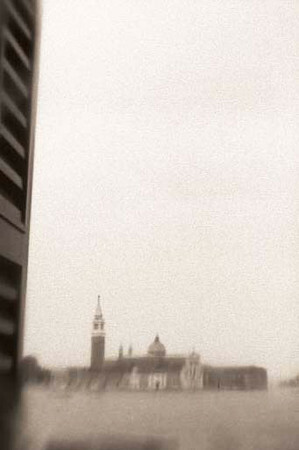 The belltower of San Giorgio Maggiore appears in the background. Made with a toy plastic Diana camera. © Beverly Brown. All Rights Reserved. 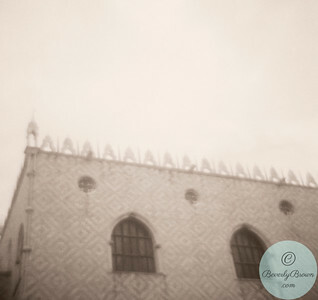 Photograph of the Doge's Palace in Venice, Italy. © Beverly Brown. All Rights Reserved. 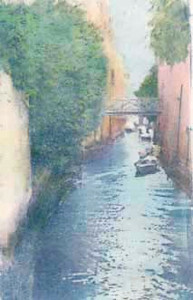 Canal in Venice, Italy with a boat and lush greenery from private gardens. 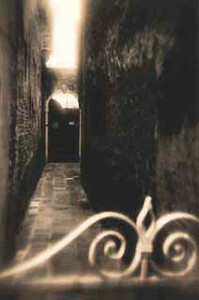 Hand-tinted cyanotype. © Beverly Brown. All Rights Reserved. 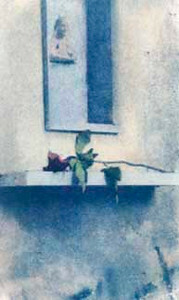 A single rose placed in a shrine on a building in Venice, Italy. 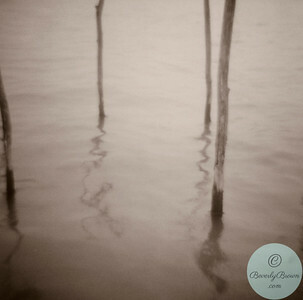 Hand-tinted cyanotype. © Beverly Brown. All Rights Reserved.